Your package is the biggest billboard for your brand. Isn’t this part of brand building? Sure is. But food packaging has so many intricacies that there’s a whole subset of services you should be considering. Many design firms will create a pretty package, but very few will consider FDA compliance, nutritional statements guidelines or materials usage based on a thorough culinary understanding. In addition to signing off on perfectly beautiful package design for your product, we recommend asking these questions before you have the files sent to the printer. 1. Are all of your nutritional call-outs accurate and true? Did you know that there are industry guidelines that determine whether your product is “high in protein” as opposed to “a good source of protein”? Tossing around language like that without supporting facts can get your product pulled from shelves. Find out what you can accurately say about your products, then (only then) start shouting it from the rooftops. 2. Does your production facility agree with your allergen statement? You may know that your product is naturally gluten free, but until you check with your production facility, that claim may be false. 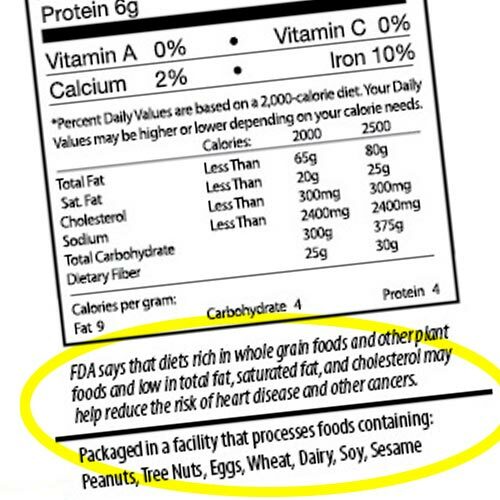 Even small amounts of certain allergens like wheat, dairy, nuts and soy can cause great harm to susceptible consumers, followed by the backlash of negative PR. . Check thoroughly about all cross contamination possibilities within your production process before listing (or failing to list) them beneath your ingredient statement. 3. Is your color palette expandable for line extensions? Creating one package in a vacuum is simple, but it must be done with forethought if future products are going to line up. Make sure that you have a packaging map for product expansion so that your future line extensions present a congruent and compelling story when they are sitting together on the shelf. 4. Will your product show well no matter how it’s stocked? Boxed products have it easy, there is clearly a front, back and two sides, but bags and other unstructured packages can pose some questions for the stock clerk. Make sure that you provide great looking faces in multiple directions and solutions like shelve-ready cases to frame your products and make them stand tall. 5. Do the cooking instructions or recipe on the back of the package give the consumer foolproof results? Consumers love recipes and ideas straight from the source. Who better to give them the exact ratio, technique or flavor combination? Build on this trust by testing and retesting your recipes before featuring them on your products. If it’s easy, delicious and works every time, you’ve just gained a loyal customer.